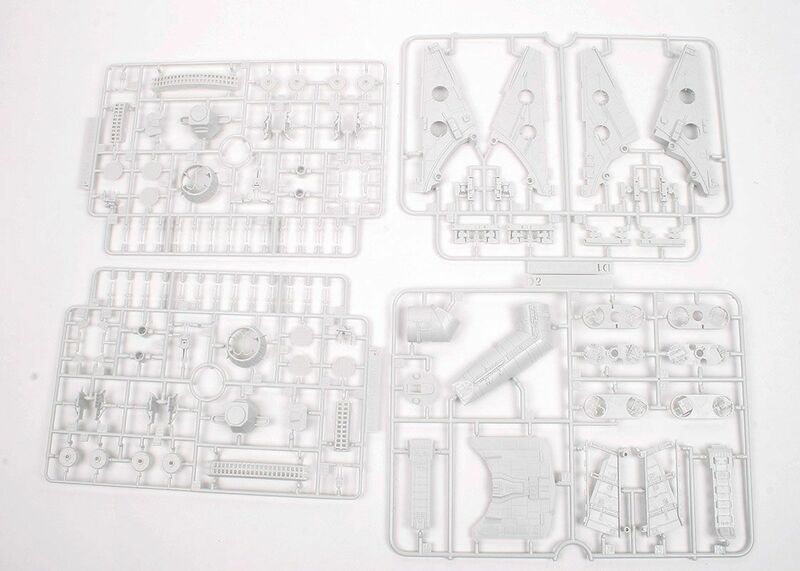 The kit comes in a nice big, deep box and inside you will find a mass of sprues. 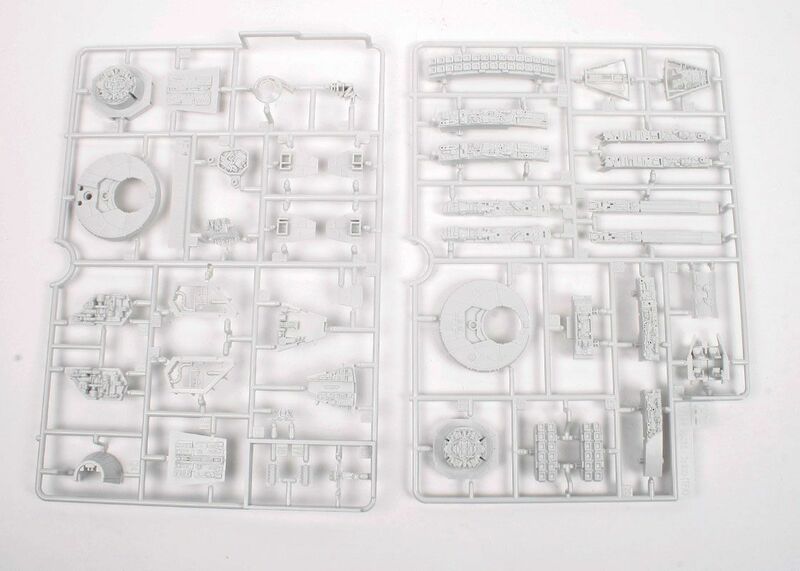 In all you get eight light grey-coloured sprues, one tan-coloured one, the two main halves and a very impressive grey sprue that also contains a clear section on one side and a clear blue one on the other. 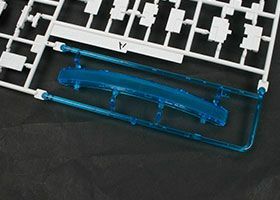 First of all an explanation of the blue clear parts, these can be used if you obtain the separate lighting kit available from Bandai, if not, you go with the grey part for this area. 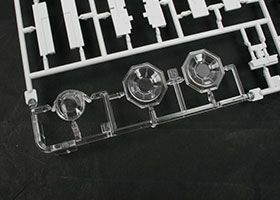 The kit also gives you the option of the cockpit area with or without the clear 'glass' because many of the models used in the films did not have any clear parts fitted because they reflect light sources etc. This is the later version of Hans' Millennium Falcon, with all the revisions you will see in the latest movie, the most obvious being the large oblong scanner on the top, which replaced the one knocked off whilst the Falcon was inside the Death Star. The overall detail in this kit is stunning, vastly superior to the 1/144th version done by Fine Molds a number of year ago and it really shows you how far moulding technology has gone. The depth of detail along the side panels for instance is stunning, and this is one area that the Fine Molds one certainly did not excel at. 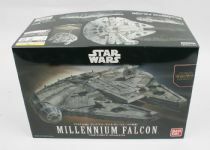 The kit includes four figures (Rey, Finn, Chewbacca and Hans Solo), posed either standing or sitting, plus the robot BB-8. The kit has the option of posing it once completed either 'in flight' attached to a sand-effect base plate, or with the legs down and the access ramp lowered. 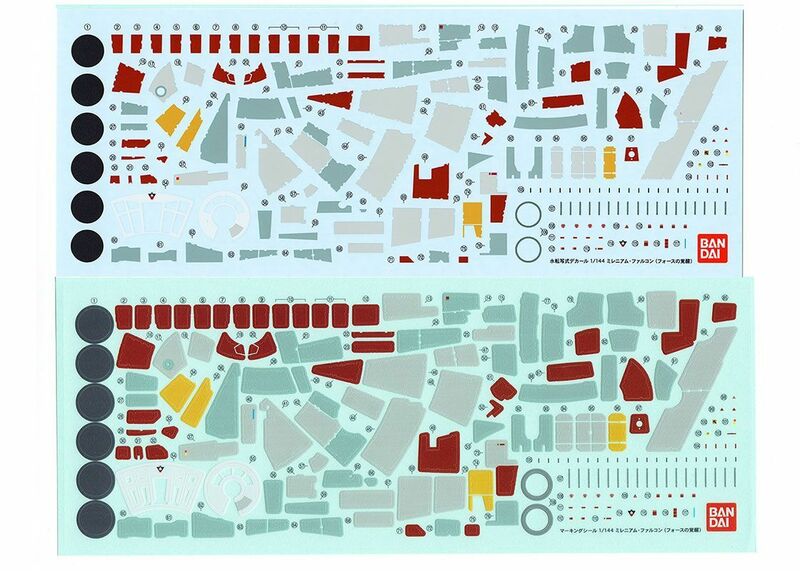 The two decal sheets offer all of the various markings and coloured panels on the Falcon, these are beautifully printed with perfect register and colour. 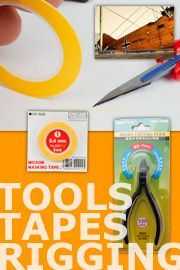 The only down side may be their number and the fact that the accompanying placement diagram is restricted in size by that of the instruction booklet and it is pretty small. The other downside is that this is very much a Japanese product, so all written instructions are in Japanese, as are the colour notes, with no paint range or numbers to help you out. That said, there is huge potential for artistic licence with the colours anyway, so this probably won't hold many back! This is a very, very impressive kit. 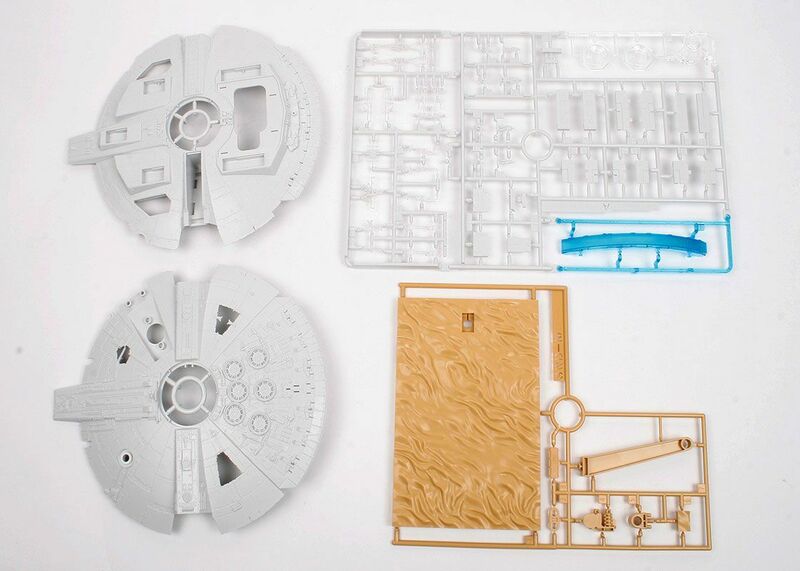 Bandai have shown everyone how to mould plastic and the manner in which this one is made just make you go 'phew!'. 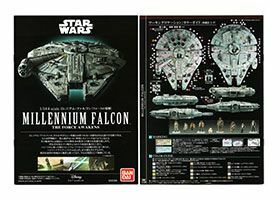 It is a MUST for all Star Wars fans as well as anyone interested in sci-fi or movie subjects. 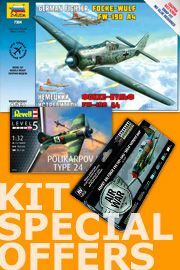 This kit is currently on sale from a limited number of retailers in the UK for around £64, whilst you can buy it from Japan for less than this, be aware that shipping to the UK (or elsewhere in the world) will incur regional import duty and taxes as well as shipping handling fees that will probably result in it costing the same or more that £64. Either way, it is worth it, believe me!